Comments: There aren't many pink-flowering wisteria. 'Honbeni' is probably the best known. Grows more slowly than many of the other cultivars. Good choice for smaller garden. Slightly fragrant 12-16 inch racemes. 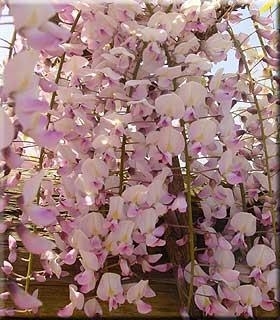 Also sold as W. 'Pink Ice'. The large-sized plants are in 6 gallon pots and very robust.